Depending on the maturity of your green beans right now, this recipe could be exactly the diversity you’re looking for with a surplus of beans… or it could be a few weeks late, as is the case with MY green beans. Doh! Actually, as cute as this teepee turned out, I’ve discovered that I don’t love pole beans. 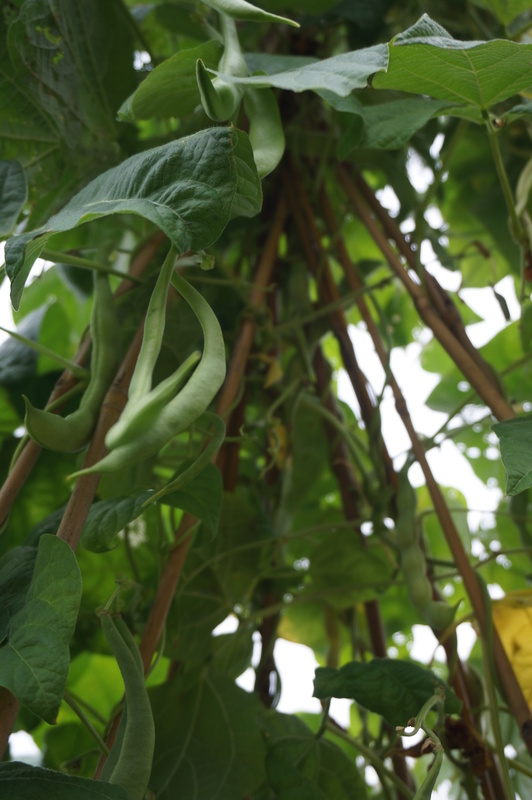 They seem a little stringier and tough than bush beans…anyone else feel that way too? 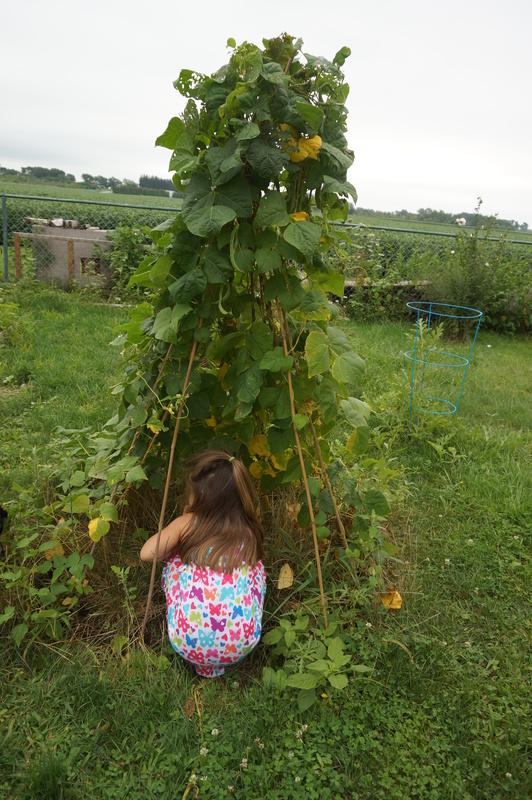 I will use the teepee next year for a different climber or perhaps even flowers, and plant bush beans. Anyone know the correct spelling of “teepee”? According to Wikipedia, it can be spelled “tipi”, “tepee”, or “teepee”. Spellchecker likes “tepee”, but I always thought it was “teepee”. 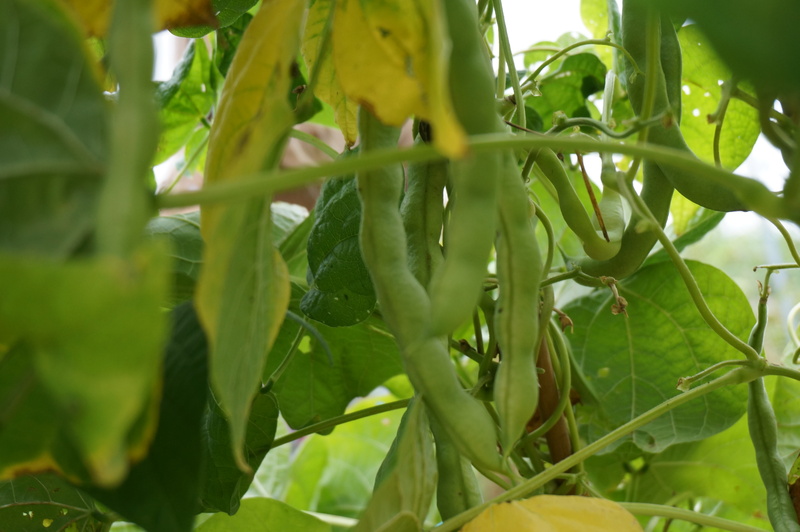 Anyway, fortunately for me, my in-laws planted more bush beans than the two of them could consume, and gladly handed me a large shopping back of green and wax beans! (And I didn’t even have to pick them!! Bonus!) They also passed on a recipe I’ve been salivating over for a year now. 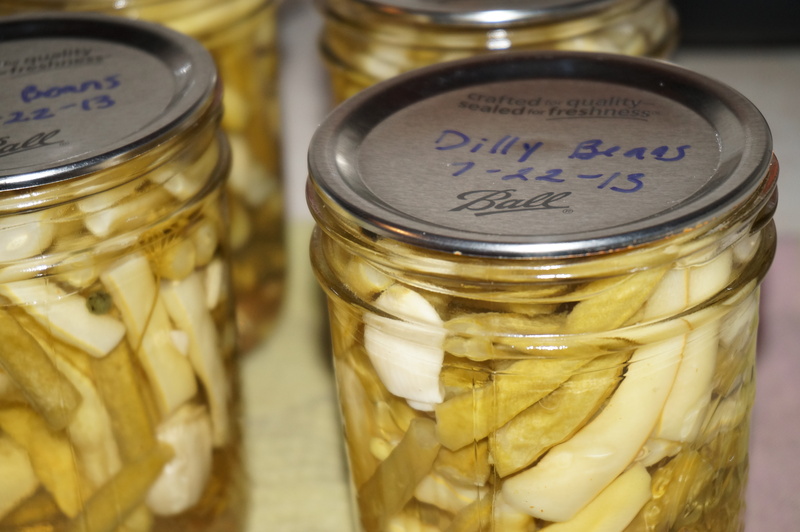 I’d never heard of “dilly beans” before I was given a taste last year, and WOW! Mind. Blown. They are like combining my favorite flavor – dill pickles – with my favorite vegetable – green beans. What’s not to love? Nothing. That’s what. There’s actually a recipe for Dilled Beans (what a boring name! Not nearly as country and cute as “dilly”!) in the Ball Book of Home Preserving. I kind of combined Ball’s recipe with my in-law’s recipe, because Ball calls for red bell peppers, which I NEVER have at home, but also called for peppercorns, which I thought sounded like a nice addition. I’m going to give you my combined recipe, and I’ll mention substitutions as we go along. Prepare canner, jars, and lids. Combine salt, vinegar, and water in stainless steel saucepan over medium-high heat. Bring to a boil, stirring to dissolve salt. You can trim the beans to “jar-length” or into “grocery store style frozen cut green beans-length” like I did. Personal preference trumps aesthetics! 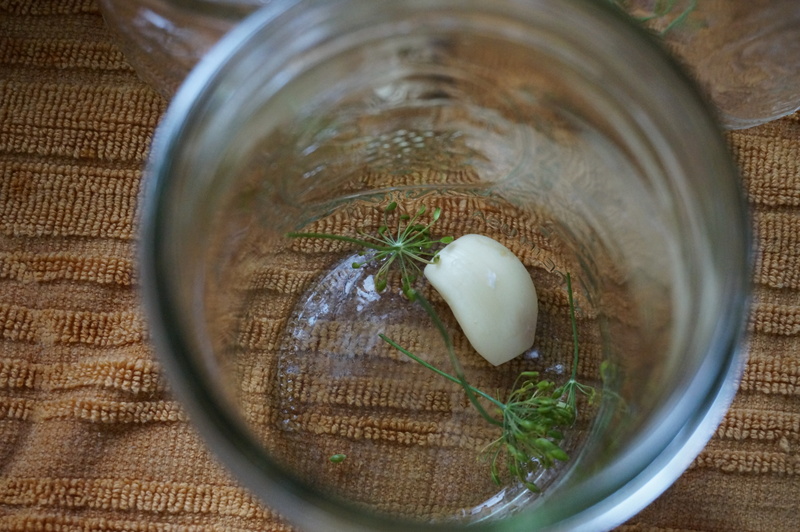 Place 3 peppercorns, 1 or 2 sprigs of dill (or 3…), cayenne (or one strip of red pepper), and one clove of garlic in each hot jar. I wussed out on the cayenne here and only used a “smidgen”. Seriously. 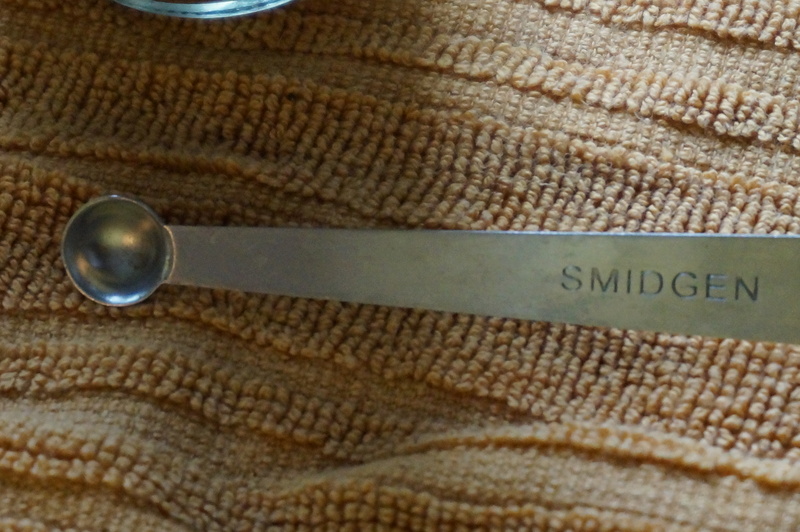 My measuring spoon says “smidgen”. Isn’t it cute? Pack beans into jars to within a 1/2 inch headspace. Ladle hot brine into jars to cover beans, leaving 1/2 inch headspace. Remove air bubbles, adjust headspace if necessary. Wipe rim. Center lid on jar, tighten ring with normal pressure. Do not over-tighten. Place jars in canner, ensuring they are completely covered with water. Bring to a boil and process for 10 minutes. Remove canner lid. Wait 5 minutes, then remove jars, cool and store. 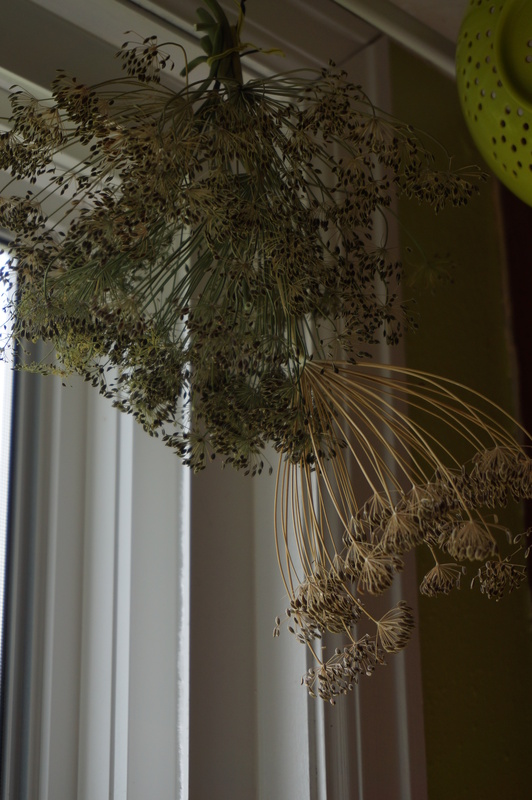 *Dill sprigs are the smaller “flower” of the entire dill head. You can use scissors to cut the sprigs from the head. I never seem to have enough brine, no matter how much the recipe calls for. I went ahead and tripled this recipe because I had more like 5lbs of beans, but couldn’t fit all the pints into my canner. So I simply refrigerated the last jar of dilly beans. 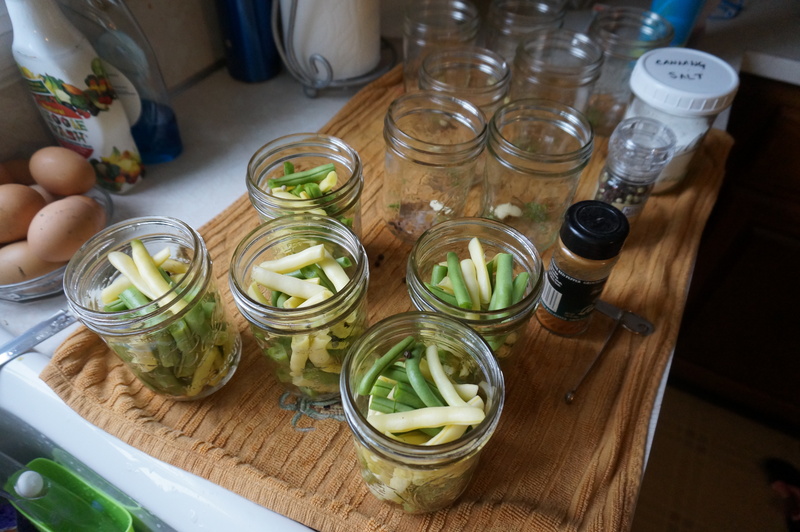 This worked, but give them a week to really pickle correctly! I kept trying them every day, and by about 7 days the two remaining beans were nice and pickly flavored! Ha! I do think the flavor is best canned, though. 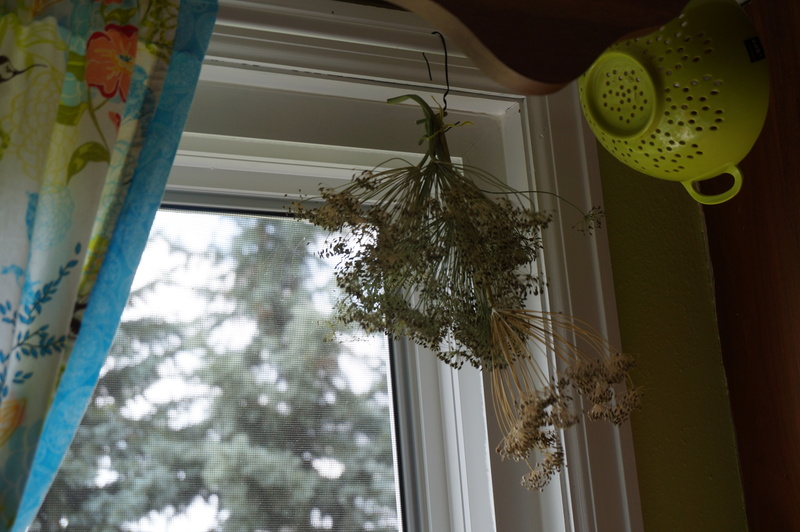 If you were lucky to be given several giant heads of dill from your parent’s garden like I was, hang them up to dry! Once the seeds are dry, you can harvest them and store them in a jar for future recipes! I just store mine in an old “dill seed” spice jar because it’s already labeled, and it fits on my lazy susan. So far I haven’t had an issues with molding, although if you store them before they are completely dried, that may happen. In the above picture you can see the difference between a head of “completely dried” dill, and one that still needs a week or so. In the meantime, it makes me look all productive and stuff with the dill hanging there, doesn’t it? Ha ha! Combine salt, vinegar, and water in stainless steel saucepan over medium-high heat. Bring to a boil, stirring to dissolve salt. Place 3 peppercorns, 1 or 2 sprigs of dill, cayenne (or one strip of red pepper), and one clove of garlic in each hot jar. Pack beans into jars to within a 1/2 inch headspace. Ladle hot brine into jars to cover beans, leaving 1/2 inch headspace. Remove air bubbles, adjust headspace if necessary. Wipe rim. Center lid on jar, tighten ring with normal pressure. Do not over-tighten. One more thing… great taste buds think alike, apparently! 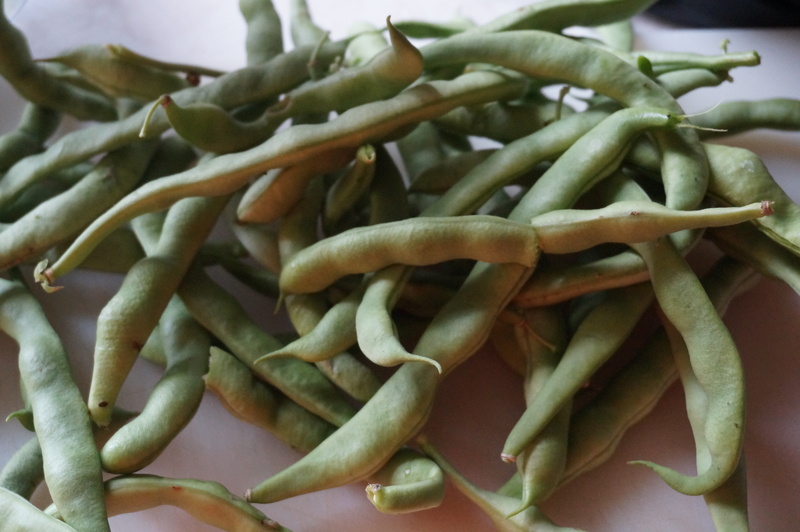 Just yesterday, as I was working on this post, my favorite sister-in-law, Erin, posted this Japanese green bean stir fry recipe! It looks DELICIOUS, and I think I’m going to go pick some beans this weekend at my mother-and-father-in-law’s garden just to try it!